No, this isn’t a minimum security prison, it’s the courtyard at Washington Middle School in Seattle’s Central Area. I asked my daughter if anyone ever goes out there and she said, “I don’t think we’re allowed to.” Sigh. Dismal, neglected spaces like this send a message to our young people that we don’t care about the time they spend in school. And that’s just one particular instance of an overall lack of quality in the public schools that sends a message to parents that they should look to the burbs for something better. The people who run diverse urban schools like Washington have a Herculean task just to keep things up and running, so this is no diss on them. But seriously folks, can’t we as a community do better than this? Photo by the author. This post is part of a series. Yes, more should be done. The decay that has set in and our public school system is crumbling. The system needs big, institutional change. But the problem is, it ain’t gonna happen. Such a project needs money, more money then is in their tight budgets. And right now all the money is set on attacking the system. Think Bill Gates. Think Democrats for Education Reform. And now we have charter schools that will be taking even more money out of school budgets. Our educational system is only going to get worse. As a community can’t we do better than this? Yes, we can. Perhaps it would be better to find ways that will actually make things better instead of chiding the community to do better, thinking one’s work is finished, and going home. I’m a Junior Husky alum and never stepped foot on that courtyard. The moss under the picnic table is pretty wonderful in an artistic perspective, but terrible from an education perspective. The issue is more than maintenance, it’s design. 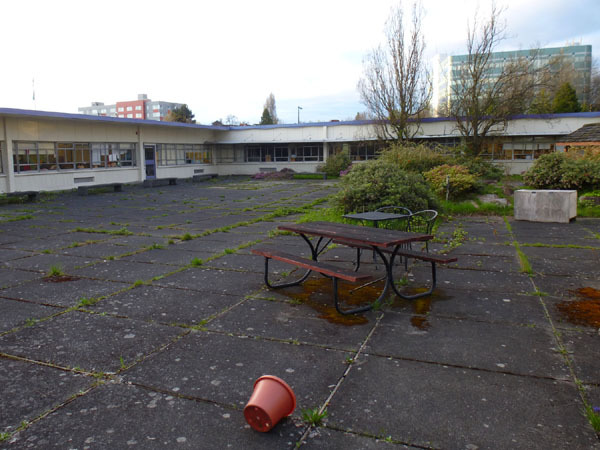 Even if it was beautiful and spotless, who’s going to say “let’s all go out and play on the concrete!” This space needs a playground, a garden, and a basketball hoop. This courtyard has been cleaned and updated by the PTSA. It looks beautiful in comparison to this shot. Thanks to the community there have been changes made. I’ll see if I can find some pictures.